This is the official time based on the RFID all runners were asked wear during the run. This is 2:29 minutes less than the time I observed as I crossed the finishing line. This is because, there were lot of runners at the starting point and it apparently took me 2:29 minutes to get to the starting point. That's the time I took to complete the Singapore Marathon today. This timing is way over my target of 4 hours, but I am glad just to complete. I will know the official time shortly. Official results will be based on the RFID tag that was given to all full marathon runners. There were over 30,000 runners from 30+ countries participating in various events and over 6500 runners in the full marathon (42.195 KMs) alone. I was never alone and had company till the very end. This helped me overcome the mental wall that had risen after 24 KMs. This is the first marathon outside India for me. The organization was flawless and kept up to the high Singaporean standards. The entire process, from registration to medal collection was planned very well and user friendly. I only wish there were more spectators along the way to cheer the runners. I was disppointed not to have finished under my target.. I am not sure if that is a 'practical' target for me.. age is catching up with me.. Yes, encouragement and blessings from all of you really helped..
Ram, you did pretty good, i think. Wishing you good luck for the future marathons. Its really inspirational for me to do some physical activity! Congratulations on finishing it. Best of luck for the future ones. Congratulations! It is for sure inspirational to see you make this achievement. Keep it up and I am sure you will achieve your target. As sundar said, itz a very gr8 inspirational for all of us. Thanks a bunch for your wishes.. this will keep me going.. 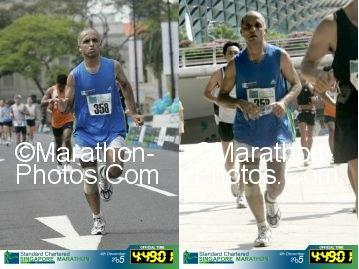 The next marathon I have been eyeing is in Chennai on Feb 5th, 2006. I am not sure, if I will be ready for that one.. will see..